In central Kenya, the Kambiti East Mango Self Help Group is using clean energy drying technology to reduce post-harvest waste and access new markets for a stronger community economy. Samuel Munguti examines a handful of dried mangoes in Kambiti, Kenya. 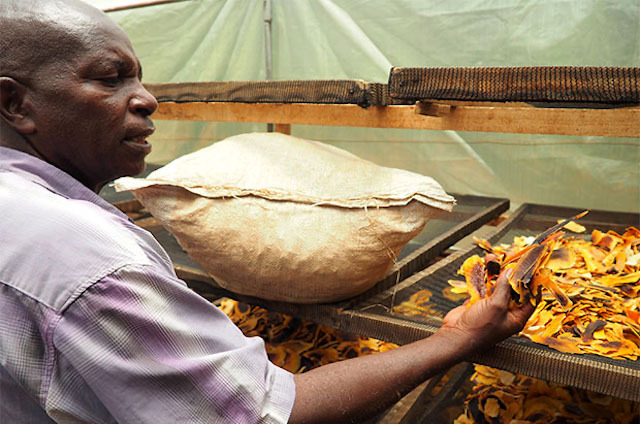 Samuel Munguti holds a handful of dried mangoes, the bright orange leather now turning dark brown after cloud cover prevented sufficient drying, causing the mangoes to rot. "This is how it always used to be. We relied on the weather and sometimes, many times, it caused this," he said, pointing to a sliver of shriveled mango. Samuel is one of fifteen mango farmers in Kambiti East Mango Self Help Group, located in Murang'a County in central Kenya. Formed in late 2013, this group came together with the help of a local community-based organization (CBO) after struggling to find a market for their fruits. The project centered on decreasing the amount of post-harvest losses by sun drying their mango into mango leather. However, the project had barely gotten off the ground when the CBO suddently withdrew its support. The Kambiti group carried on, utilizing the skills they had gained in mango drying, but unfortunately they still suffered from high rates of rotting during the drying process. And it wasn't just the drying process that was causing these issues. Kambiti's farmers struggled with disease and fruit flies, which left their mangoes spoiled. "We had a problem of diseases in the mango, and farmers didn't know how to take care of their trees in terms of pruning," said Patrick Sila, Chairman of Kambiti. In 2015, Kambiti joined YieldWise – an initiative of the Rockefeller Foundation and implemented by TechnoServe in Kenya – with the aim of training more than 20,000 farmers on post-harvest loss prevention techniques, increasing market demand for mango by linking farmers to new buyers and finance, and piloting technologies to improve the storage and shelf life of mango. Through YieldWise, Kambiti's farmers participated in hands-on agronomy trainings to improve the quality of their mangoes. "They trained us on how to take care of our mango trees, how to prune, how to harvest and they taught us how to use these fly traps," said Patrick. Frida Mbai, Chairlady of Kambiti, had the opportunity to attend quality control trainings hosted by the Agriculture Technology Development Center, where she learned about good hygienic practices, such as wearing proper uniform and establishing handwashing stations. "We also learned that if a mango falls on the ground, you don't just pick it up and use it. You need to wash it, or get rid of it," she said. 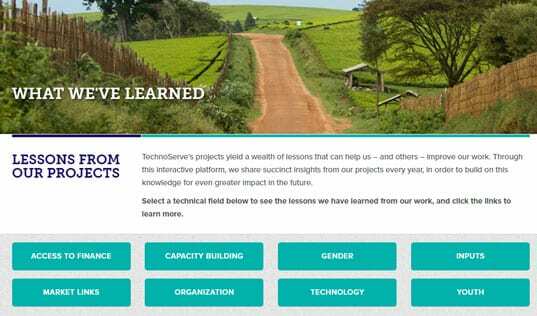 TechnoServe also connected Kambiti with Village Industrial Power (VIP), a social enterprise startup commercializing innovative clean-energy solutions for rural industries and communities throughout sub-Saharan Africa. 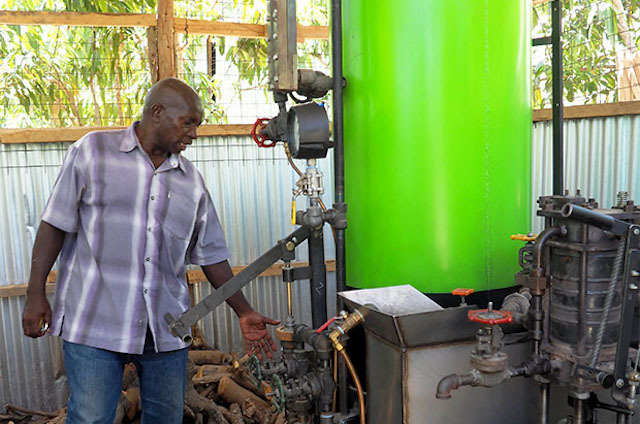 As part of a pilot project, VIP provided Kambiti with a mobile power plant, valued at roughly $17,000, which uses agricultural waste as fuel, creating thermal, electrical and mechanical energy to transform crops into higher value products. Super-heated steam produced by this power plant dries these mangoes at record pace, significantly decreasing the amount of loss during the drying process. In fact, 30 kgs of mangoes can be dried within nine hours, whereas sun drying the same weight previously took 48 hours. As a result of the YieldWise initiative, Kambiti's farmers are producing high-quality mangoes that are then dried using the new technology from VIP. In the first year of operation in 2014, Kambiti produced just 26 kg of mango. In 2015, that grew to 66 kg, and in 2016 it reached 96 kgs, but Kambiti experienced losses of over 80 percent of their yields post-harvest. Now, with the help of the mango drying machine, Kambiti is producing roughly 400 kgs of dried mango annually. The predominant buyer of Kambiti's dried mango products is Azuri Health Limited, one of the largest providers of dried fruits in East Africa, which distributes predominantly in Nairobi. 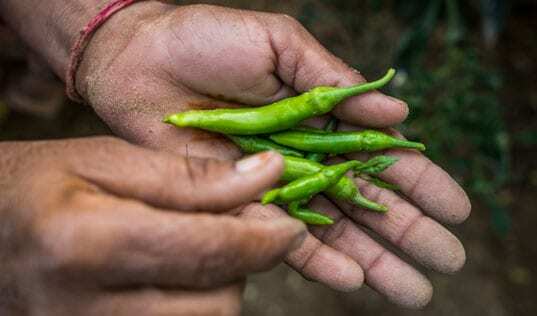 Since Kambiti primarily sources from member farmers, they are now having to source from other farmers in the community to meet demand. "Now we are out of mangoes. Then, we had more than enough. The demand is now more than we can produce," said Samuel. Kambiti now has its sights set on gaining certification in order to sell their dried mango on their own.